This is the first installment of a two-part story about the McMurray family. Julia McMurray '08 is featured in part two. Aug. 16, 2016 — I grew up swearing I would never attend Grinnell College. Not only had my mother, Anne Royal McMurray '48, and father, Charles McMurray '49, gone to Grinnell, met each other, and married, so had my paternal grandparents, Murray 1910 and Margaret Miller McMurray 1909! 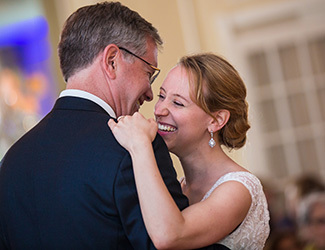 Spoiler alert: It is with no small sense of irony and great pride that I point out my daughter Julia McMurray '08 attended Grinnell and met and later married her college sweetheart, Max Kuipers '09. I could not wait to put some distance between myself and my heritage of small-town Iowa life (Webster City), the family small business (Murray McMurray Hatchery), and small Iowa college (Grinnell). Two out of three isn't bad. I left town. I didn't go into the family business, though I was thankful one of my cousins did. But I did attend Grinnell. It turned out to be one of the best decisions I ever made. By my senior year in high school, I had narrowed my choices to Carleton and, reluctantly, Grinnell. I was self-aware enough to realize that I would be swallowed up in a university. I chose Grinnell in large part because I was impressed with the faculty, it had the Grinnell-in-London program, and I had a disappointing experience spending a weekend at Carleton. I later became a tour guide at Grinnell as a result of that experience. I played high school football and remain an advocate for team sports. But I was ready for a new range of experiences at Grinnell. Athletic Director John Pfitch, who had coached my dad in basketball right after WWII, wasn't happy that I didn't want to play football, but we ended up friends. A group of us later formed a men's volleyball club team. We were used by established teams in the region to “mop their gym floors.” This was the late '70s, and Grinnell athletics didn't assume their current trajectory until George Drake stepped in as president in 1980, after I graduated. In my time, we always had a handful of strong swimmers and divers. I wrote for the S&B as a columnist on and off, beginning my first year — that '70s hair looking back at me from the recently released archives was a blast from the past. I majored in English literature and added a second major in American studies. After Grinnell-in-London, I attended the University of East Anglia for a semester and returned to Grinnell vaguely headed toward a career in journalism or publishing. A senior year internship with Meredith Publishing in Des Moines helped get me into the Harvard-Radcliffe publishing summer school after graduation. With few jobs in publishing available in the fall of '79, I segued into journalism later, including a decade at The Wall Street Journal in New York and Chicago. From there I followed a career track that has included magazine journalism and book-length corporate histories. I don't think there was any doubt about giving to Grinnell, although Warren Buffett's endowment-building magic during the '80s and '90s made it easier for my generation to think we could afford to go light on giving during our career and family-building years. I wanted both of our kids to at least look at Grinnell. At the same time, I was conscious of not wanting to oversell the school and turn them off. Both did consider and visit Grinnell, and our son Matthew chose Emory University instead. He had a great experience there, so no hard feelings. Julia chose Grinnell. I am proud of the fact that Julia is a fourth-generation Grinnellian and that more than 20 McMurrays, spouses, and offspring have attended Grinnell. I hope those who are still with us continue to support Grinnell, and I think the plans for a new humanities complex/center should offer a good opportunity for our generation to give back to Grinnell, to honor those who have gone before, and to support students for decades to come.